Now imagine for a moment that we didn't have the dams. A pleasant Saturday afternoon boating and swimming at Fishhook Park. Catching a salmon for dinner below Ice Harbor Dam. Watching a barge full of Palouse wheat steadily making its way under the Highway 12 Bridge in East Pasco. These are all part of the experience of living the Tri-City lifestyle -- relaxing, laid back, enjoying the sun and our rivers. And it's all made possible by dams on the Columbia and Snake rivers. As a Port official, I get to see firsthand the many benefits that dams provide, including the movement of cargo up and down our beautiful rivers. Right here in the Tri-Cities, many of the products vital to our local, state, and national economy arrive by barge. Drive a car? A large portion of the diesel and gasoline we use in the Tri-City area is barged to Pasco and trucked out to our local gas stations. At certain times of the year, this can be up to 50 percent of the fuel we put in our vehicles. For our farms, fertilizer is barged in to help us grow the world's greatest potatoes, apples, grapes and the many other crops prized in the Mid-Columbia. One of the newest commodities to arrive will be wood chips. Beginning in September, the chips will be barged from lumber mills at Bingen and White Salmon on the Columbia River to the Port of Pasco's barge slip. From there, the chips will be transferred to trucks and driven to the Wallula paper plant to make packaging materials for recyclable cardboard boxes. The largest commodity moved on the river system is wheat. In the Tri-Cities, we have four large grain terminals that transfer wheat from trucks to barges that make their way to Portland and other deep-water terminals. From there, the grain is loaded onto ocean going vessels bound for Asia. There are 27 of these truck-to-barge grain terminals on the Snake and Columbia rivers. All told, barging on the inland Columbia Snake River System moves approximately 10 million tons of cargo valued at over $3 billion each year. I find it amazing that all this commerce is happening on our rivers and for most of us is barely even noticed. Barging would no longer be an option. 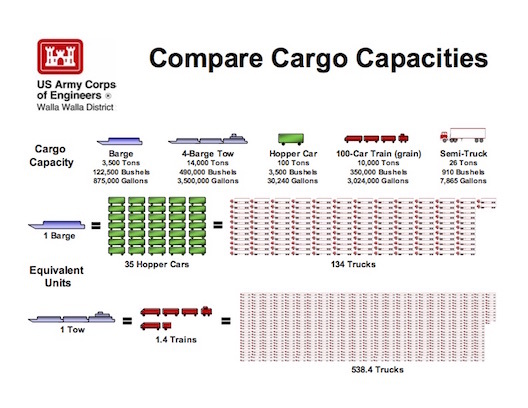 For the cargo on just the Snake River alone, that would mean 43,610 more rail cars or over 167,000 semi-trucks. I don't know about you, but when I'm driving my family to Portland along Interstate 84 or Highway 14, I'm glad to see all that cargo on barges on the river instead of on a semi-truck in the lane next to me. It makes environmental sense, too. Barging uses four times less fuel than trucking and minimizes greenhouse gas emissions. It's all the more bewildering then that some groups want to remove the dams, saying that all those products moved by barge should just be put on rail or in trucks. That's like saying we no longer need the by-pass highway in Richland because all those cars can just use George Washington Way. Providing multiple modes of transportation adds capacity to the system, keeps shipping costs competitive, and provides resiliency to freight movement. With railroads already at peak capacity and a growing shortage of truck drivers, it's crucial that we keep all modes of transportation -- truck, rail, and barge -- so that our economy can grow and thrive. Want to tour a tugboat, walk inside a giant salmon, experience the Wanapum Tribe culture, and much more? Bring your family and come learn more about our rivers, our way of life at RiverFest 2018 on Saturday, Sept. 8 at Columbia Park in Kennewick. 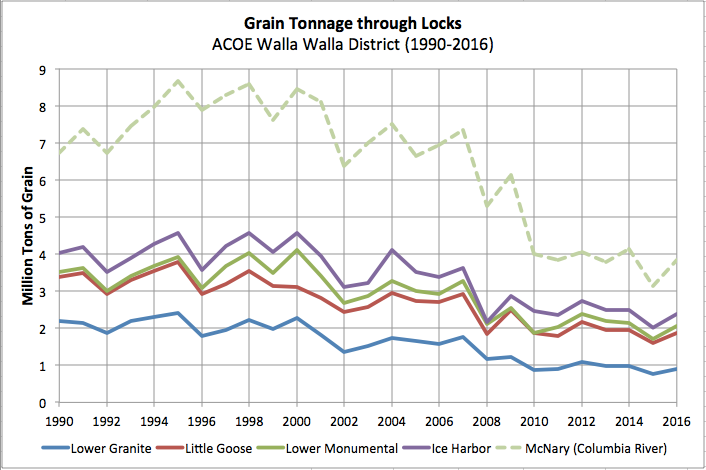 Randy Slovic: This writer conveniently lumps all of the Columbia and Snake River dams into the same package so he can fudge over the fact that barge traffic on the Snake has declined by 50% in the last 20 years. Rail transportation is faster and just as economical. You don't send trucks to I-84, you send them to the closest rail line and the cost for rail improvement is revenue neutral in considering the cost benefit analysis of the dams. Dori Luzzo Gilmour: I'm going to keep a tally starting today to keep track of the "liberal bias" comments on the Herald. Please note this is the 3rd (!) Pro- dam article in promotion of the upcoming pro -dam RiverFest exhibition that does not have a single representative of the tribes, fish biologists, or other environmental representatives. I'm personally not pro or con dams, in fact Randy Hayden made some great points regarding barging. But to those commentators that complain of liberal bias need to start reading all the articles in the paper. Not just the ones confirming their bias. And RiverFest organizers, please stop acting like this upcoming forum is presenting the complete picture. Your the host, you get to invite. But it's not a complete view. Randy Slovic: You can tell how ridiculous their argument is when they talk about grain going in trucks down I-84. There are rail lines on both sides of the river and the majority of our grain is traveling in those already. Randy E. Hayden is the executive director of the Port of Pasco.